The undersigned have the honour to lay before Your Excellency the Final Report of the Board of Engineers on the Design and Construction of the Quebec Bridge. Our digital library collection grows day by day, as volunteers and staff at the Falvey Memorial Library here at Villanova University continue to scan different works from both our own collection as well as collections generously loaned from other institutions. Because Villanova is a Catholic university, much of this material is of related interest, i.e. our collection includes scanned Catholic manuscripts, works from Augustinian scholars, collections related to Irish history, etc. Of course, not every item in our collection comes from this area, so I’ve decided to highlight one item from our collection today with more of an engineering-historical bent. 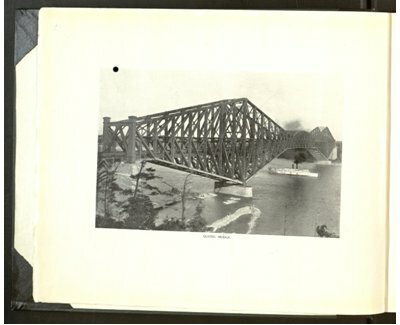 Published in 1919, and donated to Villanova in 1944, the digital library currently has posted two volumes containing the final report from the board of engineers on the design and construction of the Quebec Bridge. With its abundance of information, figures and stats on the bridge, this material may be of interest to civil and structural engineers on its own merit; however, what makes this a more interesting read is that the Quebec Bridge itself is famous above and beyond other bridges for three reasons: the first is that, at 987 meters, the bridge is the longest cantilever (i.e. non-suspension) bridge in the world; the second and third reasons are related – the bridge is also famous for collapsing not once, but twice during construction, the first occurrence in 1907, the second in 1916. Fortunately for the travelers and commuters among us, bridge collapses, though not unheard of, are a rare occurrence – and collapsing while still under construction rarer still. To collapse twice, however, is exceptionally rare. Therein, the story of the construction of this particular bridge is a fascinating tale – the initial warning signs of the first impending bridge collapse were ignored, and eventually when pleas from on-site engineers to halt construction on the bridge were finally heeded, the message did not arrive to the construction site in time before disaster struck. The resulting collapse cost the lives of 75 bridge builders. When construction of the bridge began a few years later, disaster struck again when the central span of the bridge was being raised into position – the span fell during the raising, killing an additional 13 workers . This particular report covers the time period of the second bridge building, including the time period when the central portion fell into the river (the central portion was re-raised and the bridge eventually completed, leading to this report). While the later sections of this report are very “engineer dense”, with drawings, figures and tables on the exact structure of the bridge (load tolerance of the materials used, etc. ), most users will find the General Narrative, starting at page 13 of the book, the most interesting portion of the read. 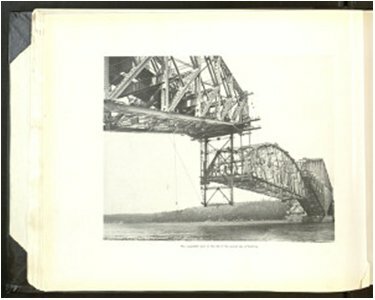 It recounts the issues with the first bridge and its collapse, what was changed in the new bridge and why, as well as a running narrative of the construction of the new span (the fall of the central span is covered on page 32). Included in this read are some interesting historical references (note the reference to the Lusitania on page 18 as the current ship with the tallest mast, and references to the Carnegie Steel Co. and Bethlehem Steel on page 25, amongst others). The complete scan of this report is available through the Villanova University Digital Library. Volume I can be found here and Volume II here. “Quebec Bridge.” Wikipedia: The Free Encyclopedia. Wikimedia Foundation, Inc. 22 July 2004. Web. Dec 2010.